Pink and frilly is not ordinarily my thing but that’s when it’s mixed with hearts and butterflies. Mix pink and frilly with Blythe dolls, winter navy and folk-inspired embroidery and it’s a different story. It’s the Mim-Pi story. I spotted Dutch label Mim-Pi at Bubble London and what caught my eye was the almost over-the-top but edgy ‘cute factor’ – springing lambs, fluffy bunnies, cute little kittens and Blythe dolls have been used as inspiration for the collection (we have one very devoted Blythe doll fan here at Babyology). The shapes are fashion-forward – puffer jackets with super-narrow sleeves and wide wrist and waist bands, layered skirts combining lots of textures and jodhpur-style leggings. I particularly like the folk-inspired cross stitch embroidery featured on many of the pieces – against the black background, it really pops. 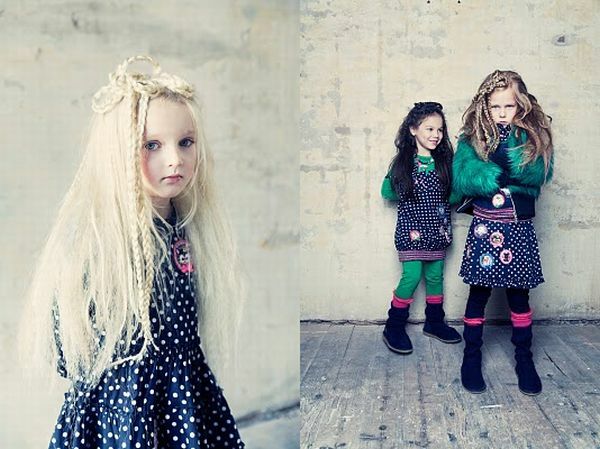 The splashes of jade green look sensational and denim is used for some fun pinafore-style dresses. Mim-Pi is available from Zyzou who ship to Australia. Pieces start at €39.95 for long sleeved t-shirts and range up to €89.95 for jackets. The Mim-Pi baby collection starts at €19.95.